Avial has a special place in Kerala Cuisine. 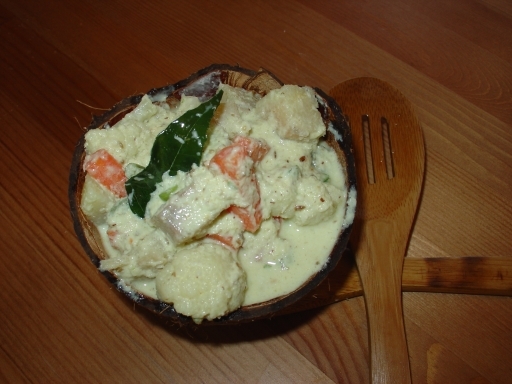 It is a thick mixture curd and coconut, with lots of vegetables. It is seasoned with coconut oil and curry leaves. Common vegetables that are used to make aviyal are yam, plantains, drumsticks, carrots etc. Some people prefer to substitute curd with raw mango or tamarind pulp. This dish can be made into a gravy and eaten with rice or be made into a semi-solid side dish. The word “avial” means assortment or a mixture – different kinds of vegetables mixed with simple sauce. I learnt this recipe from my mother-in-law. 1 tbsp Coconut oil / vegetable oil. Coarsely grind the curd, grated coconut, green chillies and cumin seeds. Keep the mixture aside. Heat 1 tbsps of coconut oil/vegetable oil in a pan, add curry leaves and remove the pan from the heat. 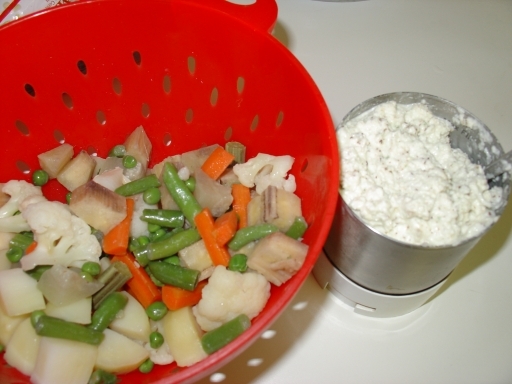 Clean the vegetables, peel and cube into pieces ( lenght wise) . Slightly boil the drum sticks with salt. Boil little water and add remaning vegetables , turmeric and salt to it. Simmer on a low flame for 10 minutes. Cook vegetables till 3/4th done and add cubed plantains, drums sticks and cook for 5-8 minutes, add coconut paste mixture and stir well. Remove from stove top. Mix the remaining coconut oil and curry leaves to the dish as a garnish. You can also use ( substitute curd for) raw mangoes peices for sour or juice of lemon/lime or tamarid paste. You can also use Yams, Ash gourd, Snake gourd and other commonly available vegetables. Do not over cook the vegetables. The curry will become mushy.You can even steam your vegetables. Turn off the heat after you add coconut paste otherwise it will curdle. Padmaja i love avial and so does little one. The color came out perfect. Avial is my all time favorite. Thanks for your version. Aviyal looks great.One of our family fav.First time here, came through Sandeepa’s blog.Nice blog..will keep visiting for more..
so is ur mom in law from kerala or are u from there. nice blog. hey this one is my hubby’s altime favorite.thanks for sharing. Yummy..This reminds me of the catered lunch we used to have in my office in Bangalore. The caterer often got avial and morkoLambu. I like Adai-Avial combo and I like to have avial with variety rice. Great looking avial !!! Thanks for sharing. Sia, Manjula & MT, thanks guys!